America’s transportation system is failing: infrastructure is crumbling and more than $100 billion is added annually to the national deficit. Without reform, this failure poses a significant threat to America's economic, energy, and environmental security. Unaccountable spending is undermining America’s long-term strategic priorities, and the nation’s infrastructure is crumbling. Failure to reform the transportation system risks deepening the United States’ dependence on oil, eroding economic competitiveness, and increasing climate disruption. Waiting to make real improvements only drives up future costs, whereas responsible policies can improve transportation and reduce the national deficit today. The Leadership Initiative for Transportation Solvency is dedicated to developing a nonpartisan solution to fund a better transportation system in the United States. Former U.S. senator Bill Bradley, former Pennsylvania governor and secretary of Homeland Security Tom Ridge, and former U.S. comptroller general and current president of the Comeback America Initiative David Walker led an intensive analysis to find politically realistic measures to fund and fix the U.S. transportation program. In 1987, President Ronald Reagan vetoed a transportation funding bill because it contained 100 earmarks; in 2005, President George W. Bush signed a subsequent transportation funding bill containing 6,229 earmarks without objection. Since the completion of the Interstate Highway System more than twenty years ago, states and metropolitan areas have cobbled together their own project and investment plans for highway, transit, and rail, but this piecemeal approach prevents the smooth integration of local, state, and federal policies and hinders potential synergies across projects. This approach also compromises federal oversight and accountability, making it difficult to measure performance and set appropriate authorization levels for the future. These shortfalls in our federal transportation program do not justify abandoning federal transportation assistance—quite the opposite. A nation’s transportation system is a major component in its economy, requiring national funding and oversight. Changes to the system will help ensure future economic growth, recognize demographic and geographic shifts in both population and preferences, advance environmental and energy security, and embrace and support innovation. All of these items are necessary to maintain global competitiveness and guarantee future prosperity. For example, higher levels of federal transportation investment are merited in urban areas where more than two-thirds of the country’s population now lives, and there are economic, environmental, and social benefits that can be gained. Instead of simply building capacity—as the current transportation program tacitly does—incremental investments in a mature U.S. transportation system should be applied sensitively, and the prioritization of project investments can be evaluated through economic analysis. Realizing the many benefits from a functional transportation system requires a national vision and greater accountability by using performance metrics derived from strategic goals. But without new revenue to meet transportation infrastructure needs, the benefits of any restructuring will remain largely unrealized. Realistic systematic pricing is required for the transportation system to serve the public interest in a responsive, trustworthy, and cost-effective manner. Twenty-first century transportation policy necessarily draws a close relationship between program design and its funding mechanism. Pricing transportation and better optimizing transportation investments will also bring tangible security and prosperity gains. Benefits accrue to individuals and society as a whole. These benefits include reductions in fuel consumption and pollution; public health improvements including better respiratory health and greater levels of physical activity; more efficient movement of goods, services, and passengers; and economic benefits through clusters of firms with convenient and affordable transportation and communications networks. Strategies for pricing transportation abound. Options include (1) pricing the carbon content of fuels, (2) low-mileage vehicles, (3) inefficient travel behavior, and (4) emissions in the production of refined petroleum products. For the nation’s economic, energy, and environmental security, we, three leaders representing the U.S. political spectrum, recommend that a solvent transportation program be ensured through the stable pricing of oil and petroleum products as the best immediate strategy. This strategy accounts for the external costs of the current transportation system and its dependence on oil. Specifically, our proposal assesses a 5 percent ad valorem tax on oil upstream (at production or importation) as the world oil price rises, and tax on gasoline/diesel downstream (retail sales) as the world oil price declines. This will dampen oil demand on the way up (to avoid a price spike) and slow price crashes on the way down (to encourage price stabilization and recover reductions in ad valorem tax revenues due to lower oil prices). If prices get too high or too low despite these efforts, the ad valorem tax can be recalibrated, as necessary, to stabilize transportation fuel costs while also funding a transportation program designed to advance federal goals. Benefits of this strategy include distributing revenue responsibilities along the oil value chain from production to consumption; buffering the impact of external events relating to oil supply over which the United States has no control; and stabilizing fuel prices for both producers and consumers for long-term market equilibrium. It is time for a significant recalibration of America’s federal transportation program. Poorly designed and obsolete programs must be eliminated. At the same time, America needs more targeted investment in projects that grow the economy and serve the key national objectives of security and prosperity. System costs—direct and hidden—must be incorporated into the pricing system to again fund transportation on a pay-as-you-go basis. Further delay in implementing these reforms only accelerates deterioration in the system while causing transportation’s contribution to the national debt to snowball. Kicking the can of revenue and program reform down the road does not help us live within our means—it simply transfers these burgeoning costs to future generations of Americans. This is both short-sighted and unfair. We can delay no longer: The time to act is now. 1 CEIP analysis based on the following data: Michel Audige, et al., “Road User Charges: Current Practice and Perspectives in Central and Eastern Europe,” World Bank Group, Transport Papers: TP-23, November 2008; Government of Australia, “Public road-related expenditure and revenue in Australia 2009,” Department of Infrastructure, Transport, Regional Development, and Local Government, Bureau of Infrastructure, Transport and Regional Economics, November 2009, www.bitre.gov.au/publications/38/Files/IS37_ RoadExpend.pdf; Government of Canada, “Transportation in Canada 2009: An Overview,” Minister of Transport, Infrastructure, and Communities, June 4, 2010, www.tc.gc.ca/ media/documents/policy/overview2009.pdf; Cesar Queiroz, “An Overview of Road User Charging Systems,” Polish Ministry of Transportation and World Bank Workshop on Road User Charging Systems, Powerpoint Presentation, June 11‒12, 2007; and U.S. Government, “Status of the Federal Highway Trust Fund,” Highway Statistics 2008, Federal Highway Administration, U.S. Department of Transportation, October 2009, www.fhwa.dot.gov/policyinformation/statistics/2008/fe10_2009.cfm. 2 Sacramento Area Council of Governments (SACOG), “Metropolitan Transportation Plan 2035 Issue Brief,” October 2006, www.sacog.org/mtp/pdf/MTP2035/Issue%20Briefs/ Road%20Maintenance.pdf. 3 Theofanis Mamuneas and Ishaq Nadiri, “Production, Consumption and Rates of Return to Highway Infrastructure Capital,” preliminary draft, August 2006. https://editorial express.com/cgi-bin/conference/download.cgi?db_name=IIPF62&paper_id=11. 5 U.S. Bureau of the Census, Foreign Trade Division, January 2011, www.census.gov/ foreign-trade/Press-Release/current_press_release/exh17.txt. 6 U.S. Bureau of the Census, Statistical Abstract of the U.S., 2011, Table 1299, www.census.gov/compendia/statab/2011/tables/11s1299.pdf. 7 U.S. Energy Information Administration, “US Imports by Country of Origin,” February 25, 2011, www.eia.doe.gov/dnav/pet/pet_move_impcus_a2_nus_ep00_im0_mbblpd_m.htm; and U.S. Department of State, Travel Warnings, March 11, 2011, http://travel.state.gov/ travel/cis_pa_tw/tw/tw_1764.html. 8 Deborah Gordon, “The Role of Transportation in Driving Climate Disruption,” Carnegie Paper, Carnegie Endowment for International Peace, December 2010. 9 Nadine Unger et al., “Attribution of climate forcing to economic sectors,” Proceedings of the National Academy of Sciences (PNAS), June 2009, www.pnas.org/content/ early/2010/02/02/0906548107.full.pdf+html and Adam Voiland, “Road transportation emerges as key driver of warming: NASA analysis,” Post Carbon Institute Energy Bulletin, February 18, 2010, http://www.energybulletin.net/node/51744. 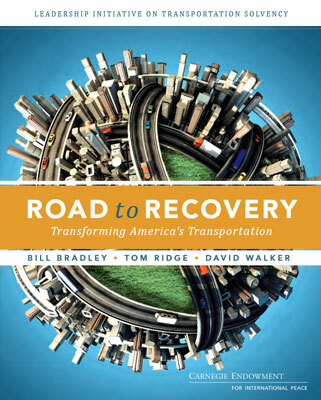 10 Brookings Institution, Bridge to Somewhere, June 2008; National Surface Transportation Policy and Revenue Study Commission, Transportation for Tomorrow, January 2008; National Surface Transportation Infrastructure Financing Commission, Paying Our Way: A New Framework for Transportation Finance, February 2009; Bipartisan Policy Center, Performance Driven: New Vision for U.S. Transportation Policy, June 2009; Miller Center of Public Affairs, Well Within Reach: America’s New Transportation Agenda, October 2010, http://web1.millercenter.org/conferences/report/conf_2009_transportation.pdf. This is a solid analysis of the issues. The U.S. needs to update its transportation infrastructure physically but also the funding structure in this era of reducing supplies and economical technologies coming on the market. Sound ideas. I think the biggest obsticle to the implementation of these suggestions is agreement across party lines in regards to the gas tax. Hopefully all Americans can see the need for long-term, sustainable transportation infrustructure that focuses on the needs of the future as well as today. Leaders in Washington can't figure out how to reduce the debt, but this report offers one good suggestion: fix the transportation system. It adds $175 billion every year to the deficit and would help reduce traffic congestion on our roads. Seems like a win-win!